Cross Crosslet Signifies the fourfold mystery of the Cross; also refer to families who engaged in the Crusades. Alba (Albion in Latin), Indo-European for "white", is the Scottish Gaelic name for Scotland. My Highland family name 'Orr' means someone inhabiting the border, the 'edge' or the shoreline. The topographic origin is from the olde English pre 7th century "ORA" meaning an 'edge', shore or slope. I have lived my life with a foot in each world, the sacred and mundane. The Scottish surname traces back to the Gaelic odhar, meaning "pale", "the pale person", "dun," fair or red haired. The Orr name dates back further than the reign of James VI of Scotland (James I of England). In 1603 when the MacGregors were proscribed, some changed their names to avoid hanging, seeking sanctuary with other clans. Orr was one of the names these "children of the mist" acquired as freedom-fighters. Padraig Mac Giolla Domhnaigh suggested that the Orr surname originates from an Anglicisation of Gaelic Mac Iomhaire. This was an old name from Renfrewshire, and a sept of the Campbells (Black Watch tartan); he stated that the name was earlier spelt Mac Ure. Historian Edward MacLysaght suggests that the name in Scotland derives from the parish of Orr or Urr in Kirkcudbrightshire, where the River Orr or Urr flowed. John Baliol (mother, Dervorgilla), an estwhile King of Scotland (1292) built his castle there. Land surrounding this river was granted to the Knights Templar by King David I (ruled 1124-1153). Hew Orr or Urr (Hughe de Urre) swore alliegence to King Edward I in 1296. Old variants include Urr, Ure, Oorr, Oare, Owr, Owar, Ower, Oar, Or, Oarr, Oayre, Oure, Our. The Ulster version of the crest of James Orr of the Villa Antoinette, Cannes, France and Belfast has a trefoil. He was the second son of James Orr of Ballygowan and Holywood House, a Belfast banker. His mother was Jane Stewart of the Stewarts of Ballintoy. His grandfather was Alexander Orr. Being a sept or division of the Campbell Clan entitles you to wear the Campbell tartan, also the Jacobite, Caledonia and Black Watch. Approximately 60% of all the Campbells tested are likely to be members of Oppenheimer’s R1b-9 sub-clan. This sub-clan is the oldest branch of R1b in the British Isles and the progenitor of other R1b lines including the Celts. This finding is consistent with the finding that most Campbells are members of the indigenous Scottish genotype concluded from my May 2007 analysis. Summer 2008 – The Campbell project has approximately 280 members. Some link Orr to the French d'Or, meaning gold. The Hebrew homonym Aur means 'light,' kabbalistically the highest uplifted state of mind. The speed of light is a function of the universe's mass, determined by its resistance to the infinite in movement emanating from itself. In modern terms, the 'Limitless Light' is the negative existence of virtual photon fluctuation in the so-called vacuum, popularly known as Zero Point Energy from which photons emerge. It is the groundstateof existence. Iona means 'dove' in Hebrew. My mother is a McKinley, a Scots Gaelic patronymic surname meaning "son of Finlay." The given name Finlay derived from Fionnla or Fionnlaoch meanig "white warrior" or "fair hero." Her middle name, Rae is also a Scottish surname, originally either a short form of MacRae (from a Gaelic personal name meaning ‘son of grace’) or a nickname from the roebuck. Surnames Agor, Bennett, Black, Campbell, Card/Cart, Clark, Dougall, Dowie, Drummond, Foxton, Greer/Grier/Grierson, Gregor, Gregory, Gregson, Grieg/Gregg, Grieve, Grigsby, Gruer, Hardy, King, Lackey/Leckie, Lawrie, MacDougall, MacFarlane, MacGregor, MacGregor-Skinner, Macpherson, MacWhannell/McIlchonnell, Magruder/McGruder, Malloch, Mathews, McAdam, McAdams, McGee/Magee, McGregor, McGrew/McGreer, McLaughlin/Gilmore/Stranahan, McNab, McNee, McWhannell, Megehee, Mitchell, Moore, Mustard, Nevins, Nichols, Offutt, Orr, Peterson, Pyatt, Ree/McLergan/McLean, Reese, Reid, Rodgers, Shanahan/Strannigan, Shankland, Shipperlee, Skerratt, Skinner, Smith, Snow, Stallings, Stirling, Thorn, Turk, Warner, Welcker, West, Westran, Whyte/White Background The Clan Gregor DNA Project is in its 10th year  and still going strong, and we have reached 538 active participants to date including some currently in progress. In the table of all surname projects the MacGregor project is the 11th in the world and 3rd largest of the Scottish clan projects (as at 2010). Up to date as of January 2011. PLEASE NOTE THAT WHEN YOU GO ONTO THE Y and MtDNA RESULTS PAGES THE CHART TAKES UP TO 30 SECONDS (sometimes longer) TO LOAD. LEAVE YOUR BROWSER OPEN AT THE PAGE - DON'T MOVE OFF IT, THE RESULTS WILL APPEAR. THIS MAY BE BECAUSE THERE ARE SO MANY OF THEM! Historical Background: The MacGregor bloodline traces its origin to a Gregor who lived in the 14th century though some genealogies go back further, to King Alpin. King Alpin’s descendants are said to have become the founders of not only Clan Gregor but, among others, the MacKinnons, MacQuarries, MacAulays and MacAlpines. The history of the MacGregors is a turbulent one and as a result the name was banned (proscribed) from 1603 to 1775, although in practice the worst years were from 1603-1642. From 1660-1693 the ban was in fact lifted, but it was re-imposed on the accession of King William of Orange as ‘punishment’ for the MacGregors taking the wrong side. This later ban had most effect in commercial terms since one could not use the MacGregor name on official documents. Many MacGregor families did not retake the clan name when it finally became legal to do so, and as a result, the Clan Gregor Society now recognises more septs and aliases than perhaps any other clan. Our hope is that over time it will be possible to understand more of the clan’s history from this project. 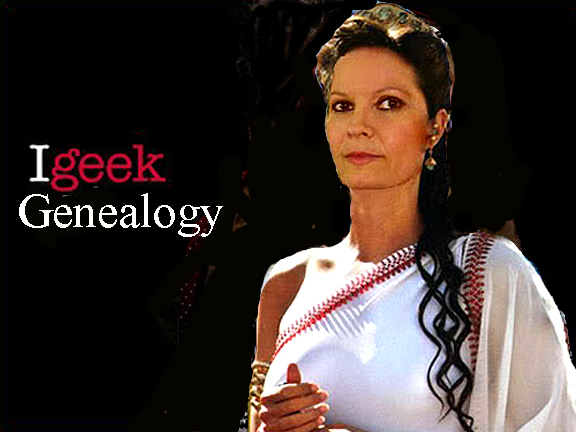 Certainly there is no doubt that those who find that their DNA matches the bloodline will be able to claim a connection with the traditional genealogies, even if, for their particular family, the paper trail has dried up. Iver or Ivarr was a popular Norse name and, as such, found over most of Scotland, particularly in the Western Isles. There seems little or no likelihood of a common origin and of a single ‘Clan MacIver’ but the waters were considerably muddied by the efforts of Principal P.C.Campbell who wrote an anonymous book ‘Account of the Clan Iver’ seeking (unsucessfully) to strengthen his petition to the Lord Lyon for the chiefship of such a Clan. There is a good deal of interesting information in the book but it has to be extracted with some care. According to ‘Ane Accompt’ Iver was one of two illegitimate sons of Colin Maol Math - the other one being Tavish Coir from whom descended the MacTavishes. Iver’s mother was said by the same source to have been the daughter of Sween of Castle Sween who as ‘Swineruo’ or ‘Suibhne Ruadh’, was the leading chief of the kindred of Anrothan, possessors of the districts of Cowal, Glassary and Knapdale. The MacIvers’ early possessions were said to have been in Glassary. First on written record is Malcolm M’Ivyr who features in the list of magnates in Balliol’s new Sheriffdom of Argyll/Lorne in 1292. ‘The Lordship of MacIver’, however, was further north; the area of country immediately south of the mouth of Loch Melfort near the site of the present-day Loch Melfort Hotel and Arduaine Gardens. The rocky spur by the road just to the south of the hotel is Dun an Garbh-sroine, site of a fortification thought to have been the MacIver base here from the 14th to the 17th century. The leading family of the MacIver Campbells was MacIver of Lergachonzie and Stronshira. Lergachonzie is just south of Dun an Garbh-sroine and Stronshira is at the mouth of Glen Shira near Inveraray where a branch of the MacIvers were Captains of the Castle of Inveraray. The standing stone in the grounds of Inveraray Castle in the Winterland, the field on which the annual Inveraray Games are held, is said to have marked the boundary between the MacIver lands and those of the MacVicars. Other subsidiary branches include the MacIver Campbells of Ballochyle in Cowal, the Campbells of Kirnan in Glassary, the MacIvers later Campbells of Pennymore on Loch Fyne, south of Inveraray, and the Campbells of Ardlarach near Ardfern, Craignish. The inheritors of the main line were the MacIver Campbells of Asknish, the old name for the area in the old Lordship of MacIver now known as Arduaine. When the family moved to Loch Fyneside, they took the name of Asknish with them and gave it to their new house. Less certain is the branch to which Principal Campbell belonged - the Campbells of Quoycrook in Caithness, allegedly descended from Lergachonzie in the persons of a Kenneth Buey MacIver and his brother Farquhar, claimed to have gone North to protect the interests there of the Countess of Argyll c 1575. From them, according to Principal Campbell come the families of Campbell of Duchernan, of Thurso and Lochend and the Iverachs of Wideford away up in Orkney. Both the Iverachs and the Campbells of Duchernan display the Campbell gyronny in their arms. Much is made of the use by the MacIvers in their heraldry of the coat quarterly , or and gules, a bend sable which is claimed by Nisbet to be the ancient arms of MacIver in contrast to the Campbell gyronny. In fact the coat is a popular one displayed by, among many others, the family of Eure as far back as 1300 and it would seem all too likely that this is a case of a fancied resemblance between that name and that of MacIver in its form ‘Ure’ resulting in its assignation to or adoption by the MacIvers in Argyll. The significance of this act has been given various interpretations. It would also seem to be the case that after this date those of the name MacIver started to use the name Campbell in addition or instead of their former one. It has been claimed that this was recognition of the MacIvers as a separate Clan and that the change of surname was part of the deal and in effect forced upon them. For this last there seems to be no actual proof whatever; what seems to be more likely is that the move was for administrative convenience; the various MacIvers in Argyll were now firmly placed under a chieftain who would be answerable for their actions to his Chief, Argyll, in whose hands his own calp very specifically remained. The move would seem a popular one and those affected appear keen to have stressed the continuation of their status as part of Clan Campbell by increasing their use of the name. I am a descendent of Stephen Hopkins of Rhode Island, who signed the Declaration of Independence. Hopkin, Hopkins, Hopkinson, and since the 17th century much associated with Wales, this is an English patronymic derivative of the original pre 5th century Germanic warrior name Hrod-berht, translating as ‘renowned-fame’. ‘Borrowed’ by the French around the time of the Emperor Charlemagne in the 8th century, its spelling was slightly changed to Robert and became equally popular. In that spelling that it was introduced into England, Scotland and ultimately Wales, after the famous Norman Conquest of 1066. Over the next four hundred years Robert, perhaps as a result of its interesting meaning was so popular that it developed a wide range of surname variations, many not obviously connected with Robert - including this one. These variants now recorded as surnames in the own right include such short forms as Dob(b), Hob(b), Hop, Nob(b) and the most direct Rob, Robb, Robin, Robbins, and Robinson. Not surprisingly with such a pedigree, Hopkins is one of the earliest recorded surnames with examples in English records such as Nicholas Hobekyn of the county of Cambridge in the Hundred Rolls of England in 1273, Rychard Hobbekynessone in the Putname rolls of Cheshire in 1354, and Walter Hopkin of Warton, in the wills record of Lancaster in 1563. Surnames were much later in Wales than the rest of the British Isles, and when first recorded and given due allowance for both a change of language as well as dialect and (indifferent) spelling, it was as ab Popkyn, or the son of Hopkin. An early Welsh example was Johannis ab Popkyn in the rolls of the county of Monmouth in 1610. Over the centuries there were several coats of arms granted to name holders. The first was probably Hopkinson of Alford, Lincolnshire, in the time of Queen Elizabeth 1st (1558 – 1603) although the most unusual - is to Hopkins of Maryland, in the American colony of that name, in the year 1764. This was about ten years before official US independence. The basic blazon has a black shield, a gold chevron in chief between two pistols, and a silver medal inscribed with the head of Louis XV, the king of France. This suggests the family were much involved in the defeat of the French during the Seven Year Wars of around that time. My mom's crest should have been "deer in headlights." Scottish Highland origin. Arms, crest and motto :--gu, a stag trippant ar; crest, an unarmed arm holding a branch of olive, all ppr. ; motto, "Not too much." Crest: A swan collared and lined proper. "The English surname Eastman is patronymic in origin, being derived from the name of the father. In this case, Eastman means "son of Easthund". Easthund is an old English personal name which means 'grace - protector' or 'favor - protector'. Over the years the ending of the name was changed to "man". Early instances of this surname includes Ricardus filius Esthund who was registered in the Essex Rolls of 1195. The 'filius' emphasizes the origins of the name meaning simply 'son of'. In the Hundred Rolls of Cambridge for the year 1273 there is a record of Geoffrey, Cecil and Hugh Esthund. An advisor with Burke's Peerage in 1991, in England, said that the crest with the collared swan at the top of the crest signifies the Eastman family were connected to royalty by way of servitude in the arts. They were most likely court poets and musicians at the time this crest was designed. The collar with the chain signifies this lack of personal freedom. The crest also signifies protection and grace and favor, all traits one would need to be affiliated with royalty. An early record of the name in America is in 1638, the year Roger Eastman left Wiltshire in England and arrived in Salisbury, Massachusetts. A notable bearer of the name is George Eastman (1854-1932) American inventor of the first practicable roll film and developer of cheap, mass-produced 'Kodak' cameras. Experiments he conducted jointly with Edison helped overcome the early difficulties of making motion pictures." BLAZON OF ARMS: Gules in the dexter chief point an escrutcheon argent charged with a lion rampant sable. Gules denotes Military Fortitude an Magnanimity. The lion signifies Strength, Courage and a Foe to Fear. Sable denotes Prudence, Mistrey and Secrecy. George Eastman. Inventor in the photography field. 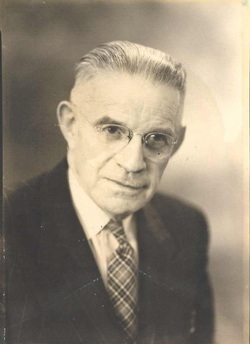 One of the founders of Eastman-Kodak. George Eastman → Maria Kilbourn → Mary Ballard → Alice Fuller → Mary Edgerton → Alice Ripley → Hannah Bradford → William Bradford → WILLIAM BRADFORD Mayflower Passenger. The farthest known ancestral line is Roger Eastman, b. 1639, Downton, England. (This is George (Kodak) Eastman's ancestor too.) Ours is a very large family with many branches and, yes, the Eastman of Eastman-Kodak is one of them! As you can see, we have 2 possible family crests. They are similar in many ways, but the stories on each vary greatly. The crest on the right has a much more colorful tale! Unfortunately, the validity of these crests have yet to be verified, so are presented here for information and conjecture only. Click on the crests for a full size view and the history of each. our ancestor�s town, Downton, England. I have compiled several interesting pictures and documents regarding Downton, including a history of the town and some commercial trade directories from later years. The first of our ancestors to reach American soil was Roger Eastman of Downton, England. He is believed to be the sole ancestor of all the Eastmans in the United States. He sailed here in April, 1638 on the ship "Confidence" , arriving at the Massachusettes Bay Colony. The Eastman family settled in the Salisbury/Haverhill region of Massachusetts and remained there until approximately 1744-48, when William Eastman, the great-grandson of Roger, lost his first wife, remarried, and relocated his family to New Hampshire. Another notation says Roger came to America with 2 un-named brothers, one who went to Georgia, the other to Philadelphia. Since there is no documentation given for that statement, and I have not found "Roger + 2 brothers" appearing anywhere else in anyone's research (and it has been researched in depth), I would question the validity of that information. Happily, one thing they all have in common is that the ship sailed in the year 1638. To show no bias towards any interpretation, I submit all versions for inspection. To view all passenger lists for the "Confidence", click on the ship. Recently added to this web site are 2 articles and 1 lecture transcript, published in 1882, 1910 and 1914, by Charles R. Eastman and C.E. Staniels. One article is a transcribed historical document from English court records in Downton, England (1475-1600) with many references to the Eastmans. The life and times of the early Eastmans here in America and Downton are chronicled thru the author's personal research in the other articles. There are many tidbits of information to be found in these documents and well worth the read. I have transcribed a wonderful story you might want to read, about Hannah and Jonathan Eastman (b. 1/8/1680) from the book "The Eastman Family of America" by Guy Rix, pub. 1901. It's the remarkable tale of Hannah's capture by Indians that starts out in tragedy and ends up confirming the strength, character, and courageous spirit of our pioneer ancestors. Although our family originally settled in Massachusetts, many of them migrated north to New Hampshire in the 1700's. Haverhill, Salisbury, Littleton and Grafton County are places our ancestors lived, fought Indians, participated in the Revolutionary War, and gave birth to the huge family tree known as the Eastmans! In time, I hope to pin point the now extinct towns of Sarachutes and Heckly, New York (1800's ancestors) and include them on this page. I believe they were originally in Oneida County but have been unable to verify this. The counties and towns were divided constantly into other townships and parrishes which makes a now non-existent town hard to trace. Did you know there were Indian Eastmans?? You can read about Stands-Like-A-Spirit here, and see all the other ancestral documents here! This interesting name is of Anglo-Saxon origin, and has two possible sources. It can either be topographical, describing a "dweller by the top of a hill", from the Olde English pre 7th Century phrase, "bufan dune", meaning "above the hill"; or it may be locational from any of the places called Bowden or Bowdon. Bowden in Devonshire and Derbyshire, and Bowdon in Cheshire are composed of the Olde English elements "boga", arched or rounded, and "dun", hill; hence, an "arched or rounded hill"; while Bowden in Leicestershire, recorded as "Bugedone" in the Domesday Book of 1086, comes from the Olde English female personal name "Burcge" (masculine "Buga"), and "dun"; hence, "Burcge's hill". There are places of the name in Scotland, from the Gaelic "both an duin", translating as "house on the hill", but the name is not widespread here. In the modern idiom the surname can be found recorded as Bowden, Bowdon and Bawdon. The surname was first recorded in the beginning of the 13th Century (see below), and other early recordings include: Richard de Bouldone, Parson of the parish of Edilstone, who rendered homage in 1296, according to the Documents Relating to Scotland; John de Boghedon, who appeared in the Place Names of Devonshire in 1333; and William de Bolden, who was Abbot of Kelso in 1370, as recorded in the Monastic Annals of Teviotdale. John Bowden, aged 24 yrs., was an early American settler in Virginia in July 1635, having arrived there on the "Paule" of London. The first recorded spelling of the family name is shown to be that of Richard de Boulden, which was dated circa 1200, in "Liber S. Marie de Calchou: Registrum Kelso 1113 - 1567", Scotland, during the reign of King William "The Lion" of Scotland, 1165 - 1214. Surnames became necessary when governments introduced personal taxation. In England this was known as Poll Tax. Throughout the centuries, surnames in every country have continued to "develop" often leading to astonishing variants of the original spelling. There are a number of possible sources for this unusual name. The first is from an Olde Frisian personal name "Botha", meaning "messenger", which has a (usually Germanic) patronymic form "Boden". The second and following related sources are as variants of the name Bowden or Bowdon and are locational or topographical surnames. If locational, Boden is from one of the places so called in England and Scotland. In England, in the counties of Devon, Derbyshire and Cheshire, "Bowden" means "hill shaped like a bow", from the Old English pre 7th Century "boga", bow, "Buga's hill". The surname can also be topographical, referring to someone who lived at the top of a hill, from "bufan dune", "above the hill". One "Thomas Boden" appears on the Register of the University of Oxford in 1583. The first recorded spelling of the family name is shown to be that of Walter Bodin. which was dated 1273, The Oxfordshire Hundred Rolls. during the reign of King Edward I, The Hammer of the Scots, 1272 - 1307. Surnames became necessary when governments introduced personal taxation. In England this was known as Poll Tax. Throughout the centuries, surnames in every country have continued to "develop" often leading to astonishing variants of the original spelling. Born in 1515 (Est.) in Downton Parish, England. John died in Downton, England in 1565, he was 50. Earliest ancestor. Surname was Easman, Estman, Estmann or Eastman. Will dated: April 26, 1564. Will proved: May 9, 1565 at Archdeaconry Court of Sarum, Salisbury, England. Born in 1539. Roger died on 17Feb, 1603-04, he was 64. Will dated: 11 Jan, 1604. Will probated: 21 Feb, 1604. Will on file with the Consistory Court of Sarum, Salisbury, England. ii. John. Born in (bef) 1564.
iii. William. Born in (bef) 1564. Born in 1564 - 1570 (Est.) in Downton, England. Nicholas died in Downton, England in 1640, he was 76. In 1600 (Est) when Nicholas was 36, he married Ann Barbara ROOKE, in Charlton, Wiltshire, England. Born in 1581 (est) in Charlton, Wiltshire, England. Ann Barbara died in Downton, England on 9 Jul 1625, she was 44.
i. Thomas. Born on 9Jan, 1602-03 in Downton, England. ii. John. Born on 24 Dec 1605 in Downton, England. iii. Margaret. Born on 26 Mar 1608 in Downton, England. iv. Roger Born on 4 Apr 1610 in Downton, England. v. Nicholas. Born on 29 Nov 1612 in Downton, England. vi. Maurice (Morris). Born on 26 Apr 1615 in Downton, England. vii. William. Born on 21Jan, 1617-18 in Downton, England. viii. Alexander. Born on 12 Sep 1620 in Downton, England. ix. Christiana. Born on 24 Nov 1622 in Downton, England. x. Mary. Born on 24Mar, 1624-25 in Downton, England. Born on 4 Apr 1610 in Downton, England. Roger died in Salisbury, Massachusetts on 16 Dec 1694, he was 84. Occupation: House carpenter. Sailed from Southampton, England on 11 Apr, 1638 on the ship Confidence. Arrived at Massachusetts Bay Colony on 30Apr, 1638. It is believed that Roger is the sole ancestor of all the Eastmans in the U.S. Received lands in the first division in Salisbury, Massachusetts in 1640-43. In 1639 when Roger was 28, he married Sarah SMITH. Born in 1621 (est) in Wales. Sarah died in Salisbury, Massachusetts on 11 Mar 1697, she was 76.
iii. Philip. Born on 20 Oct 1644 in Salisbury, Massachusetts. Philip died in Salisbury, Massachusetts on 20 Oct 1714, he was 70. On 22 Aug 1678 when Philip was 33, he married Mary Margaret BARNARD, in Newbury, Essex Co., Massachusetts. Mary Margaret died on 11 Jun 1724.
iv. Timothy. Born on 29 Sep 1648 in Salisbury, Massachusetts. vii. Benjamin. Born on 12 Dec 1652 in Salisbury, Massachusetts. ix. Samuel. Born on 20 Sep 1657 in Salisbury, Massachusetts. x. Ruth. Born on 21 Jan 1661 in Salisbury, Massachusetts. John EASTMAN. Born on 9 Jan 1640. John died in Salisbury, Massachusetts on 25 Mar 1720, he was 80. On 5 Nov 1670 when John was 30, he married Mary BOYNTON. Nathaniel EASTMAN. Born on 18 Mar 1643. Nathaniel died in Salisbury, Massachusetts on 30 Nov 1709, he was 66. On 30 Apr 1672 when Nathaniel was 29, he married Elizabeth HUDSON. Thomas EASTMAN Born on 11 Sep 1646 in Salisbury, Massachusetts. Thomas died in Haverhill, Massachusetts on 29 Apr 1688, he was 41. Served in the military. Took Oath of Allegiance in 1675. Was a veteran in King Philip's War in 1675-76. Cause of death: Killed by Indians. On 20 Jan 1679 when Thomas was 32, he married Deborah CORLISS, daughter of George CORLISS & Joanna DAVIS, in Haverhill, Essex, Massachusetts. Born on 6 Jun 1655 in Haverhill, Massachusetts. Deborah died on 15Mar, 1696-97, she was 40.
ii. Sarah. Born on 9 Jun 1683 in Haverhill, Massachusetts. Sarah died on 15 Mar 1697, she was 13. Killed by Indians in the Dustin massacre. iii. Joannah. Born on 9 Jun 1683 in Haverhill, Massachusetts. Joannah died on 17 Aug 1684, she was 1.
iv. Joannah. Born on 27 May 1686 in Haverhill, Massachusetts. Joseph EASTMAN. Born on 8 Nov 1650 in Salisbury, Massachusetts. Joseph died on 4 Apr 1692, he was 41. Joseph married Mary TILTON. Born on 8 Feb 1649. Sarah EASTMAN. Born on 25 Jul 1655 in Salisbury, Massachusetts. Sarah died on 1 Dec 1748, she was 93. On 13 Jun 1678 when Sarah was 22, she first married Joseph FRENCH, in Salisbury, Massachusetts. Sarah second married Solomon SHEPHERD. Born on 2 Aug 1684. Jonathan EASTMAN Born on 8 Jan 1680 in Haverhill, Massachusetts. Jonathan died in 1758 (est), he was 77. Executed will on 2Mar, 1747. Admitted to probate 30May, 1758. Will can be found in Vol 14, page 503, Exeter probate records. Haverhill was first settled in 1640. It was a bloody and miserable time for its residents and the rest of the colonies due to the depredations of the Indians. In 1704, Jonathan's wife, Hannah, was captured by Indians, where their 8 day old baby, Abigail, was savagely and brutally killed in front of her. Three years later Jonathan rescued her at Three River, Canada. On 8 Apr 1701 when Jonathan was 21, he married Hannah GREENE, daughter of Peter GREENE & Elizabeth DUSTON. Born on 20 Dec 1677 in Haverhill, Massachusetts. Hannah died in (aft) 1759, she was 81.
i. Thomas. Born on 17 Mar 1702. Thomas died on 20 Jul 1703, he was 1.
ii. Abigail. Born on 1 Feb 1704. Abigail died on 8 Feb 1704. Killed by Indians. iii. Mehitable. Born on 17 Nov 1707.
iv. Peter. Born on 20 Apr 1710. 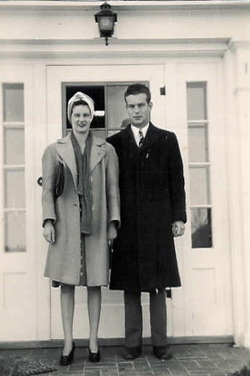 Peter married Elizabeth HARRIMAN. v. Richard. Born on 9 Aug 1712.
vi. Sarah. Born on 16 Feb 1714.
viii. Jonathan. Born on 3 Sep 1717. Jonathan married Hannah WILKINS. ix. Amos. Born on 3 Aug 1719.
x. Elizabeth. Born on 5 Sep 1721. Elizabeth died on 31 Jan 1724, she was 2.
xi. Hannah. Born on 5 Jun 1726. William EASTMAN Born on 3 Oct 1715 in Haverhill, Massachusetts. William died in Bath, New Hampshire on 30 Nov 1790, he was 75. Buried in Buried in Old Burying Ground in Bath, N.H. "Petty Borough". In 1739 (est) when William was 23, he first married Ruth CHASE. Born on 28Jan, 1718-19. Ruth died in Newbury, Massachusetts on 22 Jan 1742, she was 23.
i. Ruth. Born on 14 Feb 1740.
ii. Stephen. Born on 11 Dec 1741. On 19 Apr 1748 when William was 32, he second married Rebecca JEWETT. Born in 1722. Rebecca died in Bath, New Hampshire on 26 Jan 1806, she was 84.
i. Obadiah. Born on 26 Jan 1749 in Hampstead, New Hampshire. Obadiah died in Littleton, New Hampshire on 14 Nov 1836, he was 87. Obadiah married Elizabeth SEARLE. ii. Hannah. Born on 15 Jul 1751 in Hampstead, New Hampshire. Hannah married John LADD. iii. James. Born on 24 Sep 1753 in Hampstead, New Hampshire. James died in Haverhill, Massachusetts on 7 Jan 1853, he was 99. James married Mary SEARLE. iv. Moses. Born on 27 Dec 1755 in Hampstead, New Hampshire. Moses died in Haverhill, Massachusetts on 1 Feb 1853, he was 97. Moses married Azubah SNOW. v. Azubah. Azubah married Nathan JUDD. vii. Amos. Amos died on 2 Jun 1830 in Orford, New Hampshire. In 1823 Amos married Susan TRUELL. Jonathan EASTMAN Born in 1759 in Concord, New Hampshire. Jonathan died in Littleton, New Hampshire on 5 Jul 1829, he was 70. Served in the military. Served in Captain Joseph Hutchins and Captain Samuel Young's Companies. Credited with 2 months and 1 day in Captain Thomas Simpson's Company of Rangers. Buried in Pattenville (or Rankin Mills) Cemetery #32 , West Littleton, New Hampshire. Jonathan married Phebe LEACH. Born in 1769. Phebe died in Lyman, New Hampshire on 6 Nov 1869, she was 100.
ii. Lucinda. Born on 30 Jan 1789. On 10 Dec 1810 when Lucinda was 21, she married Samuel GLEASON. iii. Almira. Born on 15 Jul 1791 in Littleton, New Hampshire. Almira died in Irasburg, Vermont on 15 Jul 1879, she was 88. On 11 Apr 1811 when Almira was 19, she married John STANFORD. iv. Elizabeth. Born on 22 Apr 1793 in Littleton, New Hampshire. On 25 Dec 1823 when Elizabeth was 30, she married Joseph CHASE. v. Calvin. Born on 22 Apr 1796 in Littleton, New Hampshire. Calvin died in Littleton, New Hampshire on 27 Sep 1799, he was 3.
vi. Simeon. Born on 11 Apr 1798. Simeon died in Littleton, New Hampshire on 24 Jan 1889, he was 90. On 29 Nov 1822 when Simeon was 24, he married Serviah HUSE. vii. Lewis. Born on 22 Sep 1803. Disappeared on trip to Vermont. Never heard from again. viii. Rebecca. Born on 6 Jul 1806. On 7 Mar 1827 when Rebecca was 20, she married Washington GOLDTHWAIT. ix. Laura. Born on 5 Apr 1809.
x. Arza. Born on 3 Aug 1812 in Littleton, New Hampshire. Arza died in Littleton, New Hampshire on 5 Dec 1884, he was 72. On 30 May, 1839 when Arza was 26, he married Maria WINCH, in Littleton, New Hampshire. Jonathan EASTMAN Born on 28 Jan 1788 in Littleton, Grafton Co., New Hampshire. Jonathan died in Lyman, Grafton Co., New Hampshire on 6 Nov 1869, he was 81. On 24 Jan 1811 when Jonathan was 22, he married Roxanna GORDON, daughter of David GORDON & Hannah HURD. Born in 1791 in New Hampshire. Roxanna died in Lyman, Grafton Co., New Hampshire on 7 Oct 1875, she was 84.
i. Hiram Lewis. Born in 1817 (est) in Littleton, Grafton Co., New Hampshire. Elvira Lucinda EASTMAN Born on 19 Mar 1820 in Vermont *. Elvira Lucinda died in Clinton, New York in 1879, she was 58. * Source: Death certificate of daughter, Sylvia Jane (Stephens) Loomer. In 1838 when Elvira Lucinda was 17, she married John H. STEPHENS. Born on 9 Feb 1811 in New Hampshire *. John H. died in Clinton, New York in 1874, he was 62.
i. William. Born on 23 Jul 1841 in New York. iii. Charles Wilbur. Born on 16 Dec 1848 in Franklin, New York. Charles Wilbur died in Oriskany, New York on 16 Feb 1883, he was 34. On 7 Jul 1869 when Charles Wilbur was 20, he married Martha Elizabeth SCHUMACHER, in Clinton, New York. Born on 6 Jan 1853 in Rome, New York. Martha Elizabeth died in Los Angeles, California on 27 Jan 1935, she was 82. Signifies the mutual converse of human society. It is said to represent a millstone or a fer-de-moline. It is sometimes a mark of cadence representing the eighth son. It is also known as a Miller's Cross. Coat of Arms: Silver with a red cross. Crest: A right hand with first and second fingers pointing upward. Spelling variations include: Miller, Millar, Myllar, Mylar, Millare, Myllair, Mellir and many more. First found in in Dumfriesshire where they were seated from very ancient times. Some of the first settlers of this name or some of its variants were: Daniel Millar who settled in Maryland in 1714; the family, Millars and Millers, also settled in Pennsylvania, South Carolina, New Hampshire, in the 18th and 19th centuries. In Newfoundland, Richard settled in Fermeuse in 1675; John in St. John's in 1705; Samuel in Trinity Bay in 1766; Samuel Jr. and Thomas settled in Fogo, Twillingate in 1771; William and Patrick in Placentia in 1794; and many many more up to 1871. There is a Miller Head, Miller and others. The Miller family crest or crests as it appears to be stir about as much emotion in me as the name Miller has always done, that is to say none. One's need to be unique and special is betrayed by such a common ordinary name. It is perhaps the commonness of a Miller's occupation that accounts for the quad-tych of crests rather than a singular crest. Every village of some size would have needed a Mill and Miller to run the Mill. As such of the four crests the top left seems the most logical as the wheel symbol must refer to a mill wheel. imagery of a clan of proud Millers that ground flour for the kings and queens. The red and yellow really give this crest a sense of self importance. The top right crest is intriguing with its much more detailed imagery, the figures which I think or horses give it a sense of importance. Perhaps this was the crest for Millers that had horse powered Mills. I am sure there is some significance in the black marks and red line which is lost on me but at the time that family crests were common place signified some particular thing. I do not feel much of anything with this crest it seems formal and yet cold. The busy-ness of the design detracts from the sense of pride that the other crests display. The bottom left crest, is very elegant I feel, the combination of blue and grey is cold and formal yet proud. Of all the elements I like the lion with the star the most. As lions symbolise bravery and fearlessness and the red star a bringing of light. Although the red of the star could be seen to be war related somehow. The blue Greek cross I appreciate as it pre-dates the more familira Christan cross that represents the crucifix. This cross i think is more nurturing and representative of nature rather than dogma. The bottom right crest to me speaks much more of a war or something. I am not sure but these crests seem to be the sort of thing that would be painted on a banner and carried into battle. With the honoring of the sword it seems this crest speaks of supremacy at the hilt of a sword. This irks the pacifist in me and I find it hard to relate to the crest as a result. However I am impressed by the ribbon like ornamentation, it is much clearer than the others and quite striking. In terms of a visual representation of my family, none of these crests does it for me. The imagery speaks of a time so far removed from the family I know. Helmets, swords, crosses, horses and Mill wheels have not been a part of my family for so many generations that to feel pride in them seems disingenuous. But like I said at the start nothing has ever softened me to the name Miller. 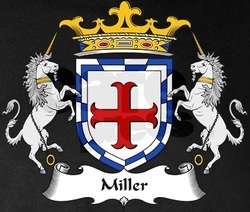 It is interesting that there are four crests associated with Miller and I would like to discover which relates more closely to my genealogy but none of the crests inspires anything in me enough to do so. I married into the matrilineal line of English Nelson[s], descended from Lord Nelson: This notable surname is of early medieval English origin, and is a patronymic form of the Middle English male given name "Nel(le)", itself coming from the Old Gaelic Irish personal name Niall, thought to mean "champion". This was adopted by Norsemen in the form "Njall", and was brought to England both directly from Ireland by Scandinavian settlers and indirectly by the Normans after the Conquest of 1066. Among the latter it had taken the form "Ni(h)el", which was usually Latinized as "Nigellus" through an incorrect association with "niger", black, dark. One Willelmus filius (son of) Nigelli was recorded in the Domesday Book of 1086 for Berkshire, and a Willelmus filius Nele in the 1304 Subsidy Rolls of Yorkshire. The patronymic form of the name appears in the early part of the 14th Century, and in the modern idiom is recorded variously as Nelson, Neilson, Nielson and Nilson. The Ne(i)lsons of Craigcaffie (Scotland), are said to have traced their descent from Neil, earl of Carrick, husband of Margaret Stewart, who died in 1256. Joseph Nelson, aged 26 yrs, an early emigrant to America, embarked from London on the ship "Plaine Joan" bound for Virginia in May 1635. Probably the most famous bearer of the name is Viscount Horatio Nelson (1758 - 1805), British naval commander during the Revolutionary and Napoleonic wars. He was killed at Trafalgar (1805) after defeating Villeneuve's fleet, and was buried in St. Paul's Cathedral. The first recorded spelling of the family name is shown to be that of John Nelleson, which was dated 1324, in the "Court Rolls of the Manor of Wakefield", Yorkshire, during the reign of King Edward 11, known as "Edward of Caernafon", 1307 - 1327.